This antibody is specific for human Myosin Phosphatase 1 and Myosin Phosphatase 2. Synthetic peptide within Human Myosin Phosphatase 1+Myosin Phosphatase 2 (C terminal). The exact sequence is proprietary. Our Abpromise guarantee covers the use of ab32519 in the following tested applications. WB 1/2000. Predicted molecular weight: 110 kDa. Flow Cyt 1/40 - 1/100. Myosin phosphatase regulates the interaction of actin and myosin downstream of the guanosine triphosphatase Rho. The small guanosine triphosphatase Rho is implicated in myosin light chain (MLC) phosphorylation, which results in contraction of smooth muscle and interaction of actin and myosin in nonmuscle cells. The guanosine triphosphate (GTP)-bound, active form of RhoA (GTP.RhoA) specifically interacted with the myosin-binding subunit (MBS) of myosin phosphatase, which regulates the extent of phosphorylation of MLC. Rho-associated kinase (Rho-kinase), which is activated by GTP. RhoA, phosphorylated MBS and consequently inactivated myosin phosphatase. Overexpression of RhoA or activated RhoA in NIH 3T3 cells increased phosphorylation of MBS and MLC. Thus, Rho appears to inhibit myosin phosphatase through the action of Rho-kinase. 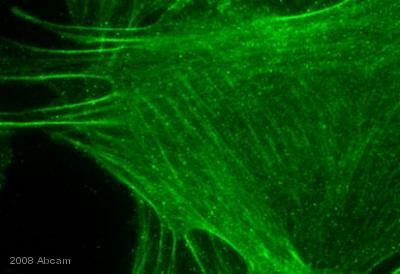 Cytoplasmic; along actomyosin filaments and stress fibers. Immunocytochemistry/Immunofluorescence analysis of NIH/3T3 cells labelling Myosin Phosphatase 1+Myosin Phosphatase 2 with purified ab32519 at 1/100. Cells were fixed with 4% Paraformaldehyde and permeabilised with 0.1% Triton X-100. ab150077, Alexa Fluor® 488-conjugated goat anti-rabbit IgG (1/1000) was used as the secondary antibody. Cells were counter-stained with ab7291 anti-Tubulin (mouse mAb) followed by ab150120, AlexaFluor®594 goat anti-mouse secondary both at 1/1000. Nuclei were counterstained with DAPI (blue). For negative control 1, rabbit primary antibody was used followed by anti-mouse secondary antibody (ab150120). For negative control 2, ab7291 (mouse primary antibody) was used followed by anti-rabbit secondary antibody (ab150077). Anti-Myosin Phosphatase 1+Myosin Phosphatase 2 antibody [YE336] (ab32519) at 1/5000 dilution (unpurified) + 293T cell lysate. Flow cytometry analysis of HeLa cells labelling Myosin Phosphatase 1+Myosin Phosphatase 2 (red) with purified ab32519 at dilution of 1/40. The secondary antibody used was goat anti rabbit IgG (FITC) at 1/500. Cells were fixed with 4% paraformaldehyde. Isotype control antibody was Rabbit monoclonal IgG (black). The blue line shows cells without incubation with primary antibody and secondary antibody. ab32519 at 1/30 dilution immunoprecipitating Myosin Phosphatase 1+Myosin Phosphatase 2 in HeLa whole cell lysate observed at 110 KDa (lanes 1 and 2). For western blotting, ab32519 was used followed by VeriBlot for IP secondary antibody (HRP) (ab131366) as the secondary antibody at a dilution of 1/10,000. ab32519 staining mouse fibroblast cells by ICC/IF. Cells were PFA fixed, permeabilized in Triton X-100 and blocked in 1% BSA for 30 minutes at 25°C. The primary antibody was diluted 1/200 and incubated with sample for 4 hours at 25°C. An Alexa Fluor® 488 conjugated goat monoclonal to rabbit, diluted 1/500 was used as the secondary. Overlay histogram showing HEK293 cells stained with unpurified ab32519 (red line). The cells were fixed with 4% paraformaldehyde (10 min) and then permeabilized with 0.1% PBS-Tween for 20 min. The cells were then incubated in 1x PBS / 10% normal goat serum / 0.3M glycine to block non-specific protein-protein interactions followed by the antibody (ab32519, 1/100 dilution) for 30 min at 22ºC. The secondary antibody used was DyLight® 488 goat anti-rabbit IgG (H+L) (ab96899) at 1/500 dilution for 30 min at 22ºC. Isotype control antibody (black line) was rabbit IgG (monoclonal) (1µg/1x106 cells) used under the same conditions. Acquisition of >5,000 events was performed. This antibody gave a positive signal in HEK293 cells fixed with 100% methanol (5 min)/permeabilized in 0.1% PBS-Tween used under the same conditions.